Multi-zone-group: Formerly called 'regions', Ceph Object Gateway can also support multiple zone groups, each zone group with one or more zones. Objects stored to zone groups within the same realm share a global namespace, ensuring unique object IDs across zone groups and zones. Multiple Realms: In Red Hat Ceph Storage 2, the Ceph Object Gateway supports the notion of realms, which can be a single zone group or multiple zone groups and a globally unique namespace for the realm. Multiple realms provides the ability to support numerous configurations and namespaces. In Red Hat Ceph Storage 2, you can configure each Ceph Object Gateway to work in an active-active zone configuration, allowing for writes to non-master zones. The multi-site configuration is stored within a container called a "realm." The realm stores zone groups, zones, and a time "period" with multiple epochs for tracking changes to the configuration. In Red Hat Ceph Storage 2, the ceph-radosgw daemons handle the synchronization, eliminating the need for a separate synchronization agent. Additionally, the new approach to synchronization allows the Ceph Object Gateway to operate with an "active-active" configuration instead of "active-passive". A multi-site configuration requires at least two Ceph storage clusters, preferably given a distinct cluster name. At least two Ceph object gateway instances, one for each Ceph storage cluster. This guide assumes at least two Ceph storage clusters in geographically separate locations; however, the configuration can work on the same physical site. This guide also assumes four Ceph object gateway servers named rgw1, rgw2, rgw3 and rgw4 respectively. A multi-site configuration requires a master zone group and a master zone. Additionally, each zone group requires a master zone. Zone groups may have one or more secondary or non-master zones. The master zone within the master zone group of a realm is responsible for storing the master copy of the realm’s metadata, including users, quotas and buckets (created by the radosgw-admin CLI). This metadata gets synchronized to secondary zones and secondary zone groups automatically. Metadata operations executed with the radosgw-admin CLI MUST be executed on a host within the master zone of the master zone group in order to ensure that they get synchronized to the secondary zone groups and zones. Currently, it is possible to execute metadata operations on secondary zones and zone groups, but it is NOT recommended because they WILL NOT be syncronized, leading to fragmented metadata. In this guide, the rgw1 host will serve as the master zone of the master zone group; the rgw2 host will serve as the secondary zone of the master zone group; the rgw3 host will serve as the master zone of the secondary zone group; and the rgw4 host will serve as the secondary zone of the secondary zone group. Make this change to the Ceph configuration file on your storage cluster; then, either make a runtime change to the configuration so that it will use those defaults when the gateway instance creates the pools. Alternatively, create the pools manually. See Pools for details on creating pools. To install the Ceph Object Gateway, see the Red Hat Ceph Storage Installation Guide for Red Hat Enterprise Linux. The procedure for installing Ceph Object Gateway is identical to the procedure described in the Red Hat Ceph Storage Installation Guide for Red Hat Enterprise Linux but with this difference: proceed to configure the zones BEFORE starting the Ceph Object Gateway daemons to avoid the need to remove default zones and pools. Ansible can install and configure Ceph Object Gateways for use with a Ceph Storage cluster. So for a simple configuration, add Ceph Object Gateways to your Ansible configuration. For multi-site and multi-site group deployments, you should have an Ansible configuration for each zone. Once you have added the hosts, you may rerun your Ansible playbooks. Ansible will ensure your gateway is running, so the default zones and pools may need to be deleted manually. This guide provides those steps. When updating an existing multi-site cluster with an asynchronous update, follow the installation instruction for the update. Then, restart the gateway instances. There is no required order for restarting the instances. 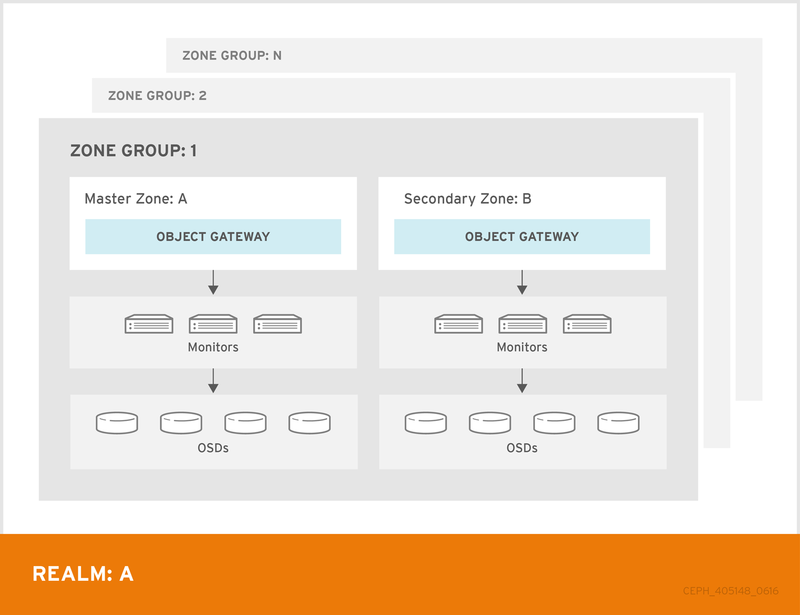 Red Hat recommends restarting the master zone group and master zone first, followed by the secondary zone groups and secondary zones. All gateways in a multi-site configuration will retrieve their configuration from a ceph-radosgw daemon on a host within the master zone group and master zone. To configure your gateways in a multi-site configuration, choose a ceph-radosgw instance to configure the master zone group and master zone. A realm contains the multi-site configuration of zone groups and zones and also serves to enforce a globally unique namespace within the realm. If the cluster will have a single realm, specify the --default flag. If --default is specified, radosgw-admin will use this realm by default. If --default is not specified, adding zone-groups and zones requires specifying either the --rgw-realm flag or the --realm-id flag to identify the realm when adding zone groups and zones. Ceph generates a unique ID for the realm, which allows the renaming of a realm if the need arises. A realm must have at least one zone group, which will serve as the master zone group for the realm. If the realm will only have a single zone group, specify the --default flag. If --default is specified, radosgw-admin will use this zone group by default when adding new zones. If --default is not specified, adding zones will require either the --rgw-zonegroup flag or the --zonegroup-id flag to identify the zone group when adding or modifying zones. Zones must be created on a Ceph Object Gateway node that will be within the zone. The --access-key and --secret aren’t specified. These settings will be added to the zone once the user is created in the next section. The following steps assume a multi-site configuration using newly installed systems that aren’t storing data yet. DO NOT DELETE the default zone and its pools if you are already using it to store data, or the data will be deleted and unrecoverable. Delete the default zone if it exists. Make sure to remove it from the default zone group first. Finally, delete the default pools in your Ceph storage cluster if they exist. The following step assumes a multi-site configuration using newly installed systems that aren’t currently storing data. DO NOT DELETE the default zone group if you are already using it to store data. The ceph-radosgw daemons must authenticate before pulling realm and period information. In the master zone, create a system user to facilitate authentication between daemons. Make a note of the access_key and secret_key, as the secondary zones will require them to authenticate with the master zone. Finally, add the system user to the master zone. After updating the master zone configuration, update the period. Updating the period changes the epoch, and ensures that other zones will receive the updated configuration. Update the Ceph configuration file on master zone hosts by adding the rgw_zone configuration option and the name of the master zone to the instance entry. Zones within a zone group replicate all data to ensure that each zone has the same data. When creating the secondary zone, execute ALL of the zone operations on a host identified to serve the secondary zone. To add a third zone, follow the same procedures as for adding the secondary zone. Use different zone name. You must execute metadata operations, such as user creation and quotas on a host within the master zone of the master zone group. The master zone and the secondary zone can receive bucket operations executed via the RESTful API, and the secondary zone redirects bucket operations to the master zone. If the master zone is down, bucket operations will fail. If you create buckets using the radosgw-admin CLI, you MUST do so on a host within the master zone of the master zone group, or the buckets WILL NOT synchronize with secondary zones and zone groups. Using the URL path, access key and secret of the master zone in the master zone group, pull the realm to the host. To pull a non-default realm, specify the realm using the --rgw-realm or --realm-id configuration options. If this realm is the default realm or the only realm, make the realm the default realm. Using the URL path, access key and secret of the master zone in the master zone group, pull the period to the host. To pull a period from a non-default realm, specify the realm using the --rgw-realm or --realm-id configuration options. Pulling the period retrieves the latest version of the zone group and zone configurations for the realm. The following steps assume a multi-site configuration using newly installed systems that aren’t storing data. DO NOT DELETE the default zone and its pools if you are already using them to store data, or the data will be lost and unrecoverable. Delete the default zone if needed. Finally, delete the default pools in your Ceph storage cluster if needed. Update the Ceph configuration file on the secondary zone hosts by adding the rgw_zone configuration option and the name of the secondary zone to the instance entry. If the master zone should fail, failover to the secondary zone for disaster recovery. Update the period to make the changes take effect. Finally, restart the Ceph Object Gateway. If the former master zone recovers, revert the operation. From the recovered zone, pull the period from the current master zone. Make the recovered zone the master and default zone. Then, restart the Ceph Object Gateway in the recovered zone. If the secondary zone needs to be a read-only configuration, update the secondary zone. Finally, restart the Ceph Object Gateway in the secondary zone. Create a realm. Replace <name> with the realm name. Rename the default zone and zonegroup. Replace <name> with the zonegroup or zone name. Configure the master zonegroup. Replace <name> with the realm or zonegroup name. Replace <fqdn> with the fully qualified domain name(s) in the zonegroup. Configure the master zone. Replace <name> with the realm, zonegroup or zone name. Replace <fqdn> with the fully qualified domain name(s) in the zonegroup. Create a system user. Replace <user-id> with the username. Replace <display-name> with a display name. It may contain spaces. After completing this procedure, proceed to Configure a Secondary Zone to create a secondary zone in the master zone group. Customers wishing to migrate from a 1.3 multi-site system, formerly called "federated", contact customer support for advice on recommended steps so Red Hat Support can look at the configuration, environment, and data first. You can configure multiple zones that will not replicate each other. For example you can create a dedicated zone for each team in a company. A Ceph Storage Cluster with the Ceph Object Gateway installed. Create one or more zones depending on your use case. Get the JSON file with the configuration of the zone group. In the file, set the log_meta, log_data, and sync_from_all parameters to false. Use the updated JSON file.